How could this film, which is clearly not aimed at youngsters, have caused controversy prior to public release? Or, cynically, how could this clearly not aimed at youngsters film (but still an animation) have highlighted itself during the dour dull days of January? Let me explain the premise of the film in a nutshell. Partly by digressing and explaining the point of the book. Gideon Defoe, talented scamp that he is, wrote The Pirates! in an adventure with Scientists to impress a girl. Simple.. If I was that girl, I would be impressed. (Maybe I am easily impressed, but a book has to make a dedication, and the dedication in that book made me go ‘aww’). 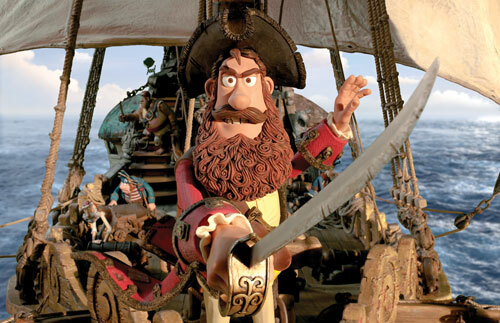 The Pirate Captain, played in the film by the devilishly foppish quintessential Englishman Hugh Grant. (I saw him filming the fight scene with Colin Firth in Hyde Park. Which was nice.) needs adventure and recognition for his services to Maritime sailing. There’s the Elephant Man, Charles Darwin, an exciting duel or two, some religious Bishop-ry. It’s all in there. And all good. Even a very short meeting with lepers. What?! Lepers! Are they, the Gods of film, mocking the afflicted for the sake of cheap entertaining thrills (although clearly not taking science, sailing and deformed dead people seriously, leaving aside the casual religious mockery that has been thrown in)? Lepra Health in Action suggest so. The fuss lies in the connotation of leprosy as, well, all about arms and legs dropping off, and of being contagious. Shun worthy in fact. Let’s face it, leper boats existed. So in terms of historical accuracy, Defoe is dead on. In terms of contagion, it is. Though treatable, so don’t panic. Surely Lepra Health in Action should welcome the fact that leprosy, long thought of as a disease of the past, has been brought to the forefront of our armchair viewing opinion? Ultimately, though, it doesn’t really matter. The book is funny, the film should be funny. Leprosy, horrible disease that it is, has massive comic potential which has been exploited time and again, with only a modicum of complaint. Not to sound like a Daily Mail reader (which I do read but only to cut my teeth on and sharpen my claws) it really does seem like political correctness gone mad. Arms do not just fall off. They are not made of plasticine and Hugh Grant does not look like a thin Brian Blessed, as portrayed in the film. Use your common sense, if you have been affected by the issue of leprosy there is probably a helpline to ring in confidence. And as the prevalence of leprosy has globally decreased, isolated to underdeveloped countries with poor standards of sanitation who will probably not be watching at the Imax in 3D a low budget brightly written and scripted comic caper, then I think cutting a whole chapter of the book was a little bit of overkill, but brilliantly stage managed to correspond with box office opening, especially as it’s a small cult classic. Cynical, moi? Not really, just realistic, and looking forward to watching the film. I'm knocking on and not getting far. I read books and lose myself in thought. The real world has given me an excuse to sit down on physical furniture. But the metaphysical one has given me wings worthy of Red Bull. I like to help, hence my day job. Secondary to living in my head, I love language and music, art and pictures. I'm not very trendy, and although I tweet I don't twitter very well at all.